Here are some key tax-related deadlines for businesses and other employers during Quarter 2 of 2018. 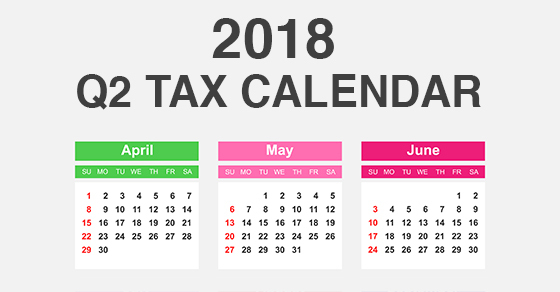 APRIL 17: If a calendar-year C corporation, file or extend your 2017 income tax return and pay any tax due, and pay the first installment of 2018 estimated taxes. APRIL 30: Report income tax withholding and FICA taxes for Q1 of 2018 (unless eligible for May 10 deadline). JUNE 15: If a calendar-year C corp., pay the second installment of 2018 estimated income taxes. Contact us for more about the filing requirements to ensure you’re meeting all applicable deadlines.